Garden City, N.Y. – On Saturday, January 14th, the Cradle of Aviation Museum hosted its first in a series of indoor drone events. Students from the Vaughn College U.A.V. Club held flying demonstrations, drone design workshops and set-up drone flight simulators. 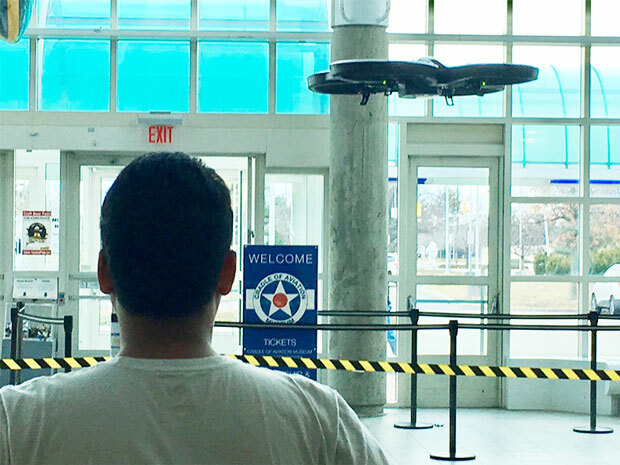 Upon entering the museum, visitors were amazed to see drones flying high, hovering and flipping. This first event is the beginning of a series of events that will lead up to the museum's Drone competition in March. “This kickoff is a great way to introduce drones to our museum community. Partnering with the Vaughn UAV club, the museum has an opportunity to teach the children of Long Island about aviation, engineering and other important STEM principals that drones provide,” said Kerri Mackay, Competitions Coordinator at the Cradle of Aviation. Drone Kickoff Day is just one of many educational events produced by the Cradle of Aviation Museum. The Cradle is home to over 75 air and spacecraft and is located on Charles Lindbergh Blvd. on Museum Row in East Garden City, NY. For more information call 516-572-4111 or visit www.cradleofaviation.org.